Doing the tidying up after Friday’s Cashflow 101 game in The Abundance Shed, packing away the money and rats and cheeses, pondering players’ dreams and their different learning styles, I find myself wondering about my facilitation style. I think I am pretty gifted at it, sorry to be so immodest, but I think you know when you are been doing something for a very long time whether or not you are any good at that. To what do I attribute that? 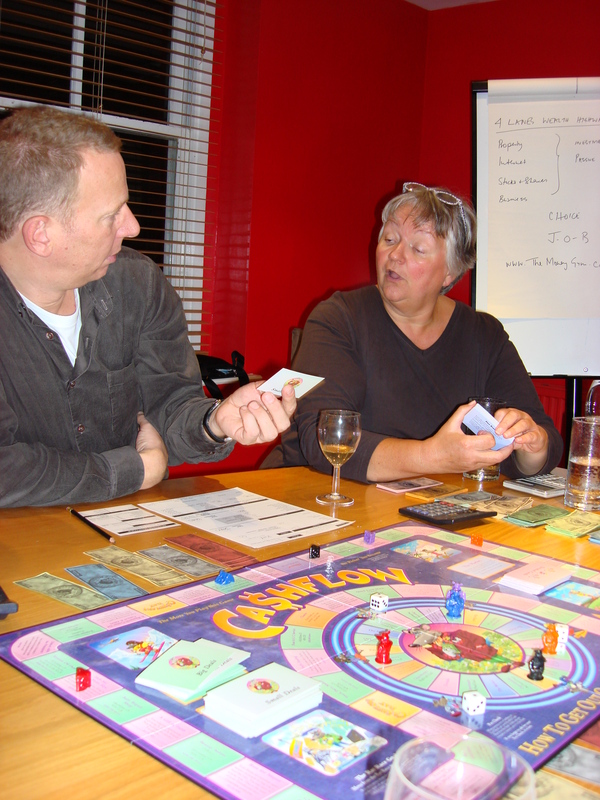 You cannot play the game as well as teach and be the banker, there is just too much going on. And I care enough about the players getting a great learning experience that I choose not to take a hand. So while I am doling out the newbies’ pay cheques, which change all the time so I have to get them to shout out the amount every go, I am teaching and encouraging the next player to take their turn. It’s a long game and unless we keep it moving some players get bored. So I am trying to set a place which is somewhere in the middle so the slower processors can keep up and the faster thinkers don’t disengage. And I am noticing when it’s their turn to get a pay cheque so they don’t forget. Some do. I give them two strikes before the rules kick in. This time, as it happens, no-one forget to collect their pay cheque. Is that a good thing or just an ingrained habit, and a scarce one at that, keep us stuck in the rat race? And I am showing them how to do their maths on their income statement, again without allowing the game to slow down too much. As soon as I can see that some of the faster mathematicians have grasped that, I encourage them to teach others sitting closer to them than I am. This lightens my load but also enhances their learning. We teach what we most need to learn. And then as the game speeds up and people start to enjoy themselves, setting aside their fears of something new and their performance anxiety, I can start to focus on their game. How are they playing? What’s “happening” to them? Do they think what they want before they throw the dice? Is that the right strategy for them, based on what I know of them? Who’s feeling left out socially? Who’s struggling on the game board and why? Who’s not getting any opportunities? The best observations are those I notice subliminally, with my senses, where I get a sense of their energy dropping or rising. So I am functioning on lots of different levels – watching, listening, feeling, sensing and calculating and making sure everyone gets what they need and catches their coach or train home on time too and is reasonably fed (BYO) and watered during the day. There’s quite a lot of logistics to manage. Then I ask them to notice what they are thinking and feeling but not saying. How is that impacting their game and the opportunities which come their way, or not? Is their game mirroring what I know of their real lives? Would they like to take this “pretend” opportunity to play the game of life and money another way, just for today, against type? Or does the way they are e.g. cautious, rash, thinking, feeling and so on, does that get great results for them in the game as well as in their real lives. If so, nothing to “fix”. It is a melting pot where we try to spin out the good from the less helpful. I want to hold my clients in the best and most supportive state to support their learning. I notice how they are breathing, what they say and what clues I can glean from that and how they are with other players? Competitive? Collaborative? Who needs to “win”? I also have to notice my needs for them, to get out of the rat race and so on. Is that important? Perhaps on a first game, yes, but on subsequent games I have to leave them to learn their own lessons in their own time and make the decisions to change their behaviour in their own sweet time. All I can do is hold up a mirror and give them the opportunities to notice for themselves, in the kindest way I can. There can be sadness as unhelpful stuff and limiting beliefs are released. What’s the best way to “win”? Does an individual player need or want to land on their dream and be able to afford to buy it? Or must they battle their way financially towards buying their dream? Who needs it to be hard? Who wants it to be easy? How difficult is it to accept help? Why is that a less valid way of achieving your financial aims and ambitions? Dice skills: throwing a six is something we are practiced at from childhood games where throwing a six was required. Not so in Cashflow 101, you might need to learn to throw a specific number to land on the precise square you need to secure a particular deal. Or you might have to throw a four, five or six to buy a Russian gold mine. Or you might just be happy to leave that all to chance on the basis that you know the Universe has your back. Or you might need to believe that throwing a dice is purely random. We are all different in this regard. But I notice some have dice throwing skills, others learn them and others don’t believe they can. How important is knowing what you want and going after it? Are you someone who facilitates good things for other people at the expense of yourself? Or does what goes around come around for you. Are you content to sit back and allow in the fullness of time, hares -v- tortoises. How to manage tea and coffee and loo breaks, and lunch. How to get them back into the game as quickly as possible. 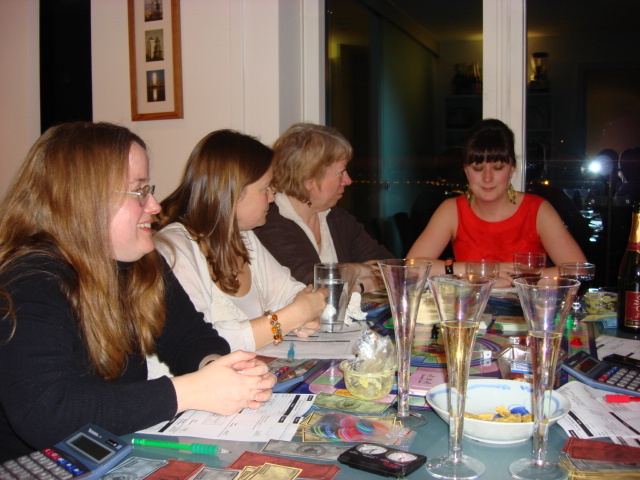 How to allow enough social interaction without too much chatting and laughter interrupting the flow of the game when others are concentrating, we are mostly here to learn, after all, as well as having a lovely day out. It’s full on. Yesterday I slept for eleven hours straight after the dear delegates went home. But as I said, it is the single most rewarding thing I do in my work and the most impactful for my clients. Every time I host a Cashflow 101 day in my garden shed I am reminded what a magical game this is for creating shifts around money and I always intend to do more of Cashflow days. I feel a very strong sense that I am called to do more and more of these. I remember fondly doing them in all sorts of venues over the last ten years including playing in my garden and finding a ten thousand dollar note blowing around in the flowerbeds afterwards! Energy is important. Sometimes a stiff talking to and a group decision to select a particular energy or good intention makes all the difference. There are so many different ways to play and so little time even in a long day which is why it can be vital to play a series of games, or at least more than once so that you have time to sync your learning and then have another go. I teach the proper rules in the morning, then we throw the rule book out of the window (metaphorically speaking) in the afternoon as the players get confident enough to start brokering deals with each other, buddying up in investment partnerships and realising how naturally talented they are at maths, trading, creating and seeing deals which others don’t, evaluating investments. Yesterday, almost no-one lifted a calculator except me. People are so much better at this than they give themselves credit for. But no-one is good at it on their own, in isolation. The best play comes from finding a way in the game to play nicely with others in a way which allows us all to be winners. And mostly we do that, though sometimes you have to look at it askance to appreciate that. That’s what we should be looking for in real life too. And that’s the beauty of the game. It gives you a chance to play in an environment when you are supported to be aware first off, then experimental next, and to see what happens when you do. Notice what’s working and where that mirrors your life and where it’s time – perhaps long overdue – to make a change?